Can We Please Use the Proper Definition of Value? I went to the AcademyHealth Annual Research Meeting over the weekend (it’s probably the biggest health policy conference of the year), and then this morning I went to the annual report for one of the regions participating in RWJF’s Aligning Forces for Quality, and I can’t stand the abuse of the word “value” any longer. The picture on the right is part of the cover of the program I came home with from the meeting this morning. Does the text strike anyone else as . . . ineffective? 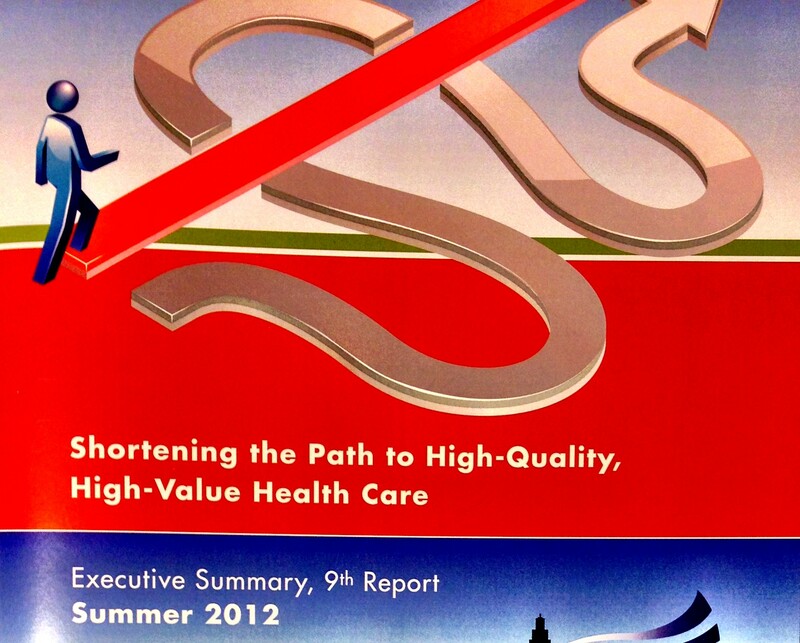 Shortening the path is great, but shortening it to “high-quality, high-value health care”? Quality can be defined differently as well, but it generally includes outcomes, patient experience, and everything a patient wants. It doesn’t just include quantitative metrics, but it also includes all the softer metrics that are important to patients. For example, the softer metrics related to a physician would include bedside manner, friendly office staff, convenience, length of relationship, and so forth. Price is the amount of money paid to get the quality. PRICE IS NOT THE SAME AS COST, NOR IS IT THE SAME AS TOTAL SPENDING. I’ve never done all caps for a sentence before, but this is the first time I felt like a sentence needed it. Cost would be the actual costs that were incurred to provide the service, but patients don’t care about cost. They care about the price, the thing they actually have to pay. And, in healthcare, beware of the word “charge” as well, which generally refers to the price a provider is asking for even if the insurer pays him something completely different. Confused? I explain provider pricing in an earlier post. Now that the more appropriate meaning of the word “value” is understood, look back at the text on the cover picture. “Shortening the Path to High-quality, Low-cost Health Care” would work. “Shortening the Path to High-value Health Care” would also work, but I guess it would not be as explicit as it would be to anyone who hasn’t read this blog post. But not Hooper Humperdink. Not him. So, next time you hear someone say, “We need to improve the value of healthcare delivered in the U.S.,” you should think, “Ah. This person wants to improve the quality and/or decrease the prices of healthcare in the U.S.” And FYI, the only way we can substantially decrease prices is to decrease COSTS first. Yes, I would say that our new absolutely most important goal in the health policy world (now that the ACA stands; for the time being at least) is to help providers decrease costs and then make sure prices follow. I appreciate the compliment on my work, thank you! Is it really true that the only way to decrease prices is to reduce costs first? First, it is possible to reduce the price to most consumers buy having greater government subsidy – of course, someone likely pays higher taxes to pay for that subsidy but if the taxes are progressive, it would lower prices for the majority of the consumers. Second, one of the obstacles to managing costs is the fact that there are so many people (the uninsured) that aren’t in the risk pool. Or at least not in a more orderly way. I see one of the big benefits of the ACA, flawed as it might be, to be expanding the pool of insured to be pretty much universal. At that point, I believe it is more possible to address the cost issue. Absent universal coverage, managing the risk pool is too difficult – unless we make the decision as a society to ignore the less fortunate. 1. I guess you’re right that we could lower prices before costs. This would cut into profits (not always a bad thing) and probably force costs down due to the new constrained financial environment for the company. 2. Yes, the price consumers pay could be reduced through government subsidies. But this does not affect the total price–it only shifts the responsibility to pay to someone else. I am interested in lowering total prices. 3. I’m having a hard time following your last point. Are we talking about costs or prices? And are we talking in terms of insurance prices or prices for medical services? Of course everyone would like to see costs decline but it’s a false choice to assume you have to pick one or the other. Waiting for costs to decline before addressing universal healthcare ignores the humas costs that are incurred waiting for the holy grail of lower costs. The ACA addresses the fact that health insurance can be too expensive for lower income people to afford without government subsidy. But the act of providing increased access to those who are currently uninsured can change the mix of services provided maybe we consume more primary care and less surgical care if we do a better job of managing obesity. The argument that we need to address costs first ignores the fact that mix matters. If we avoid more hospitalizations even if hospital costs haven’t declined, total healthcare costs may decline. Gawande’s article on medical hotspots argues that dealing effectively with high needs patients can affect overall healthcare spending. My last point argues that in order to address price in a socially equitable manner, we need to get everyone on equal or at least roughly equal footing. Trying to manage overall costs when some people only get healthcare through the emergency room is neither a humane nor particularly effective approach. At the end of my post I recognize that the ACA has solved most of what you are talking about with regards to access, so our next goal is to figure out how to lower prices and cost together. Yes we can save money through better prevention-oriented approaches to caring for the sickest among us (i.e., lowering the quantity of services consumed), and we can also save money by substituting cheaper services for more expensive ones, but the data say that the biggest thing responsible for our uniquely high level of spending on healthcare is not our quantity or services mix–it’s our prices, so that’s what I’m focusing on in this post. My understanding of costs is that for the 40 year period from 1969-2009, Medicare costs grew 400 percent and private health insurance costs grew 700 percent. Isn’t that an argument that the government is better at controlling prices than the private market? I suppose the danger is that price controls can distort the market but I suspect the margins are pretty high in drugs, devices and salaries that margin pressure wouldn’t necessarily cause shortages. Besides, the US pays the most – where would doctors go? Canada? I know the IPAB is controversial (Death Panels!) but our political system has proven to be pretty susceptible to helping create price protection for many health care organization (Medicare Part D – not being able to negotiate drug prices). This appointed board – someone compared it to the Federal Reserve – might prove to be more effective than our elected officials in making tough decisions. If we want to reduce costs, why not have a single payer system that determines prices for various things and then the providers would need to figure out how to produce that service in a profitable way? Doug, a single-payer system that sets prices and forces providers to figure out how to continue to produce services profitably is a feasible alternative. It works to control spending better than our current system, as shown by other countries’ experiences. My main problem with this is that there are so many markets out there with only a single hospital. Are we really going to let that hospital fail if they can’t be profitable in a new, extra-constrained financial situation? No, we would subsidize them. This happens already in our country. But think about the alternative, which I laid out in a previous post, where innovators find more efficient ways to provide services and then either enter the market and beat the incumbent or just buy out the incumbent and implement the more efficient processes. This may succeed better to reduce costs, and it’s not incompatible with a single-payer system as long as you structure it properly.